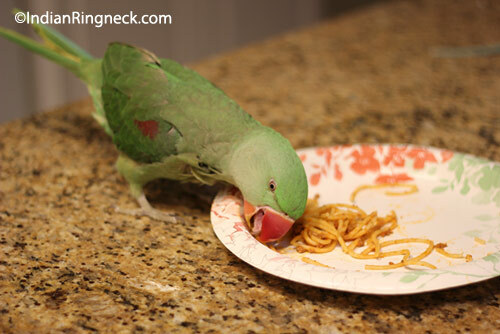 Whelp, I made spaghetti for dinner and thought my birds would like a taste of it. 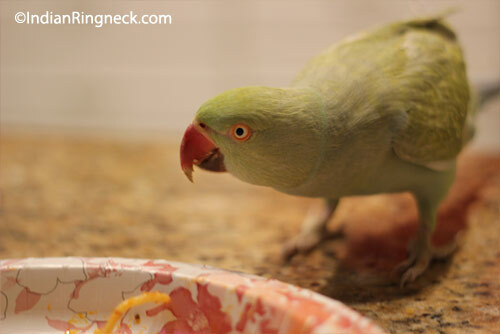 For me, it’s so important my birds be able to try all kinds of foods. Besides, the spaghetti was somewhat nutritious as it had eggplant, tomatoes, mushrooms, and lots of herbs. 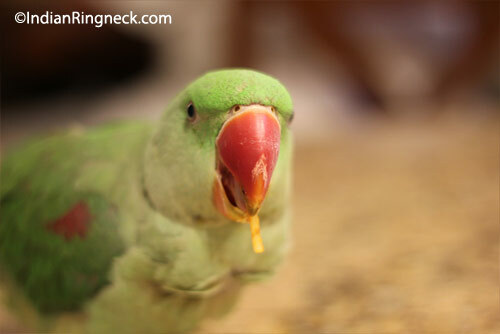 All that tomato sauce is perfect for them as it allows my ringnecks to get their lycopene. This nutrient is important because it boosts their antioxidants and gives them the proper nutrients for optimal skin and feathers. 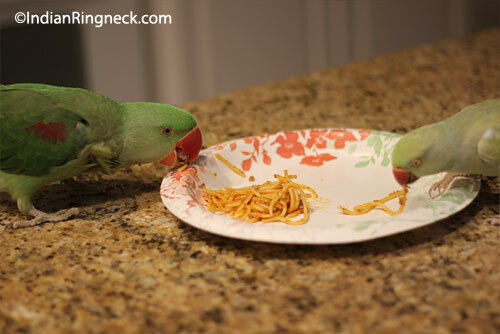 Not only is the spaghetti filled with nutrients to keep my birds healthy, but my birds enjoy eating a variety of foods too. 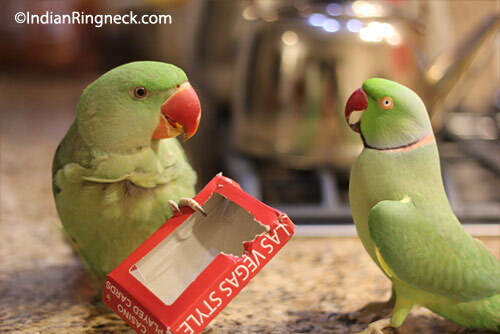 If you don’t offer your birds table scraps I highly recommend you start. 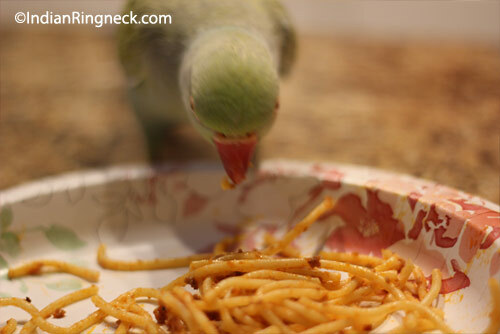 Some birds might be picky in the beginning, but over time many will come to enjoy a variety of foods if they are given the chance to learn how to enjoy them. 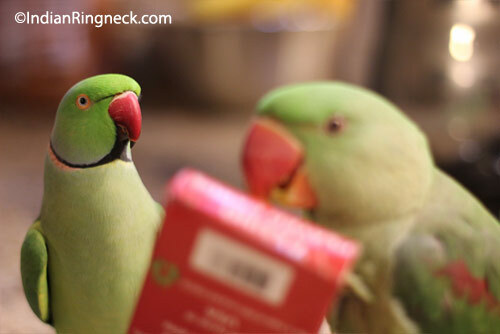 Besides, offering your birds only pellets and seeds is no way to live life, nor is it healthy. Could you survive on only one thing such as rice for the rest of your life? 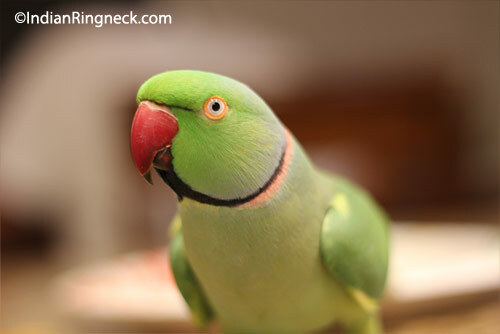 It would be boring and your body would lack a lot of nutrients–same applies with your feathered family member. 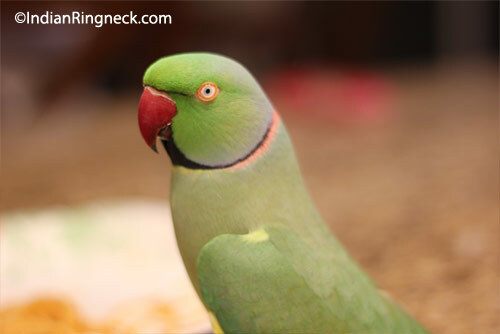 Also, ringnecks in the wild eat all kinds of foods. They are designed to feel textures, taste flavors, and enjoy the colors of nature. Just like us, birds eat with their eyes too. It’s exciting and stimulating for them to try all kinds of foods. 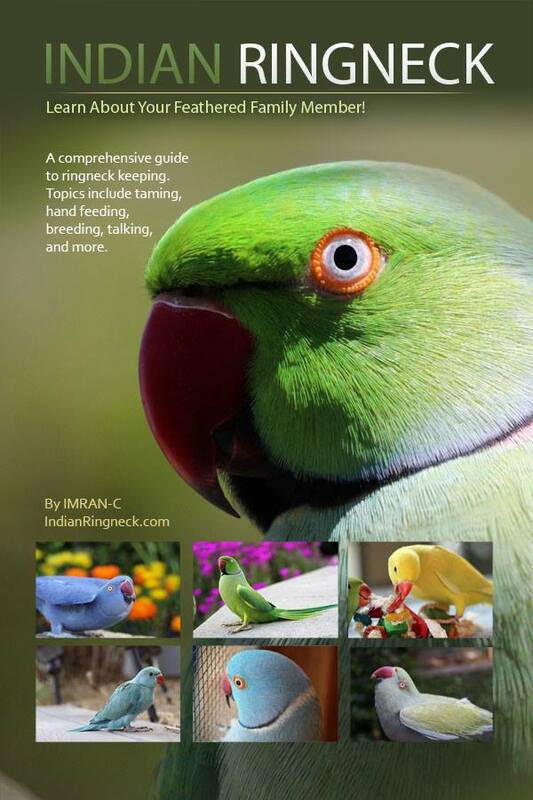 Have you seen how big a parrot’s tongue is? If not, take a second look and you’d be amazed. 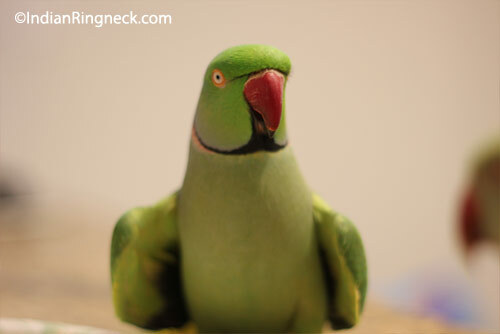 This dinner was also a great opportunity for me to introduce Osiris into my flock of birds. 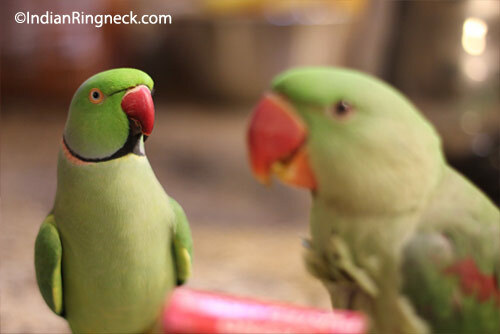 He never really interacts with other birds too much at the moment because he is too young. 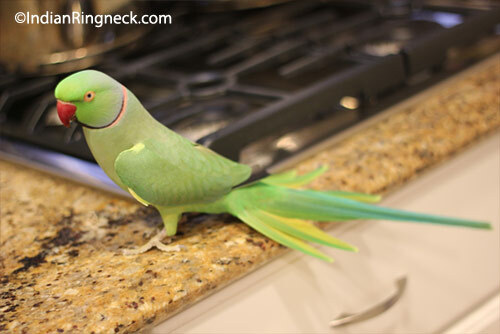 I figured putting food into the equation is perfect because it keeps my birds distracted from their usual pecking order; giving Osiris his chance to mingle with Archimedes and Devri.